The Moorpark Apricot Tree belongs to the Prunus armeniaca family. This is a hardy and attractive tree that blossoms with pinkish-white flowers. Moorpark Apricot Tree is grown from seedlings which can either be grown from seed or budded, but normally they are grown from seed. The Moorpark Apricot Tree has a late season producing large, tasty fruit. The standard Moorpark Apricot Tree can grow to a height of 15’ – 20’, while the dwarf grows to about 8’ – 10’ feet in height and has a spread of 15’ – 20’ when fully mature. The Moorpark Apricot Tree will grow in acidic, moist, rich, silt loam, loamy, sandy and well drained soils. 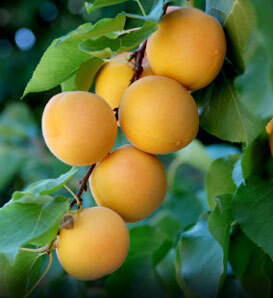 Moorpark Apricot Tree produces quite large 2 – 21/2” smooth, deep yellow skinned fruit that has an orange red blush. The fruit has a deep orange flesh. This presents the biggest challenge to apricot tree cross-pollination. The Moorpark Apricot Tree bloom in the spring and late frost damage the flowers and eventually disrupts pollination. Frosty, rainy, and windy weather curtails bee activity. Cool weather is necessary for the Moorpark Apricot Tree to bloom, but prolonged periods of such weather reduce pollen tube growth. And this prevents it from setting fruit. Heavy rainfall will definitely damage the flowers. Lack of natural pollinators will definitely prohibit cross-pollination. Though the Moorpark Apricot Tree has the ability to self-pollinate planting with a variety of other breed is recommended for quality fruits. In order to attract natural pollinators you can hang bird feeders, or put wet sand into sunny spot for the butterflies. Moorpark Apricot Tree produce fruits that resemble small, yellow peach and they are popularly used for desserts, canning, and drying. The tree requires full sun, medium irrigation and the soil should have a good drainage. Take note of brown rot, peach borer, fruit bark beetle, and plum curculio which can be very problematic.